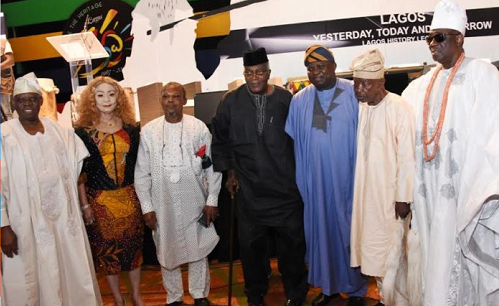 The saying that Lagos is ‘No man’s land’ came under the spotlight on Wednesday at the Lagos History Lecture held at the Eko Hotels and Suites, Victoria Island, Lagos, Southwest Nigeria, where eminent Lagosians and others kicked against the cliché. Among those who spoke vehemently against it are the Oba Rilwan Akiolu of Lagos; former Minister of Works, Alhaji Femi Okunnu (SAN); former Governor of Ogun State, Aremo Segun Osoba; Dean, College of Humanities and Social Sciences, Al-Hikmah University, Professor Hakeem Danmole; Mr Habeeb Fasinro and Governor Akinwunmi Ambode. Akiolu said it was wrong for anyone to refer to Lagos as a no man’s land as there were settlers in Lagos before others came. “Lagos should not be referred to as no man’s land because our forefathers were the founding fathers of the State. And it was after several years that the Europeans came and others,” he said. Akiolu also said he might storm the National Assembly to demand for special status for Lagos, adding that the bill for special status for Lagos was rejected because of jealousy. Also, Fasinro said such claim that Lagos was no man’s land was not only misleading but confrontational, as same abused the history of the indigenous people of Lagos such as the Aworis, Egbas, Binis, Ijeshas, Nupes, Brazilian returnees, among others. Speaking, Okunnu said those behind the claim that Lagos was no man’s land were ignorant, as they did not know what they were saying. Okunnu nonetheless noted that non-indigenes of Lagos had contributed immensely to the growth and development of Lagos. He cited the example of the creation of Lagos as a state, saying that though some indigenes of the state were fighting from the outside for Lagos to be given a full state status, two non-indigenes, who were part of Gen. Yakubu Gowon’s government, Chief Philip Asiodu and Alison Ayida, contributed in no small measure in ensuring Lagos was created. The former minister also pleaded with young Nigerians to shun ethnic and religious divide, especially in politics, saying that his generation had damaged the image and cohesion of the country because it brought ethnicity and religiosity into politics. He added that ethnic groups like Afenifere, Ohanaeze, Arewa should be playing cultural roles and not be political. Speaking, Osoba noted that the number of councils Lagos has was not enough considering the huge population of the state and that there was need to ensure every residents enjoyed the dividend of democracy. Osoba disputed the claim that Lagos was no man’s land as being championed in several quarters. “We need to understand that there were early settlers in Lagos. So whenever some people say that Lagos is no man’s land, I laughed because I know that there were true land owners in Lagos,” he said. In his lecture, Prof. Danmole argued that the first settlers in the state were the Aworis, the Eguns and others. He stated that the unparalleled growth that Lagos had attained over the years was a product of having been blessed with men and women of vision, who had been able to effectively shepherd developments in the state. Giving an insight into the history of Lagos, Danmole said Lagos Island to the indigenous population was called Eko, a name whose origin was told in two well known traditional but controversial accounts. Despite this controversy, Danmole maintained that what was fairly certain was that the Awori settlement in Lagos was earlier than that of the Benin, which eventually subjugated the emergent settlement. “Written records insist that Olofin, the leader of the Awori at Iddo divided Lagos among his children. Although many versions exist with regards to the number of children of Olofin. These children established various settlements within the Island and beyond,” he said. At the event, Ambode attributed the greatness of the State to its ability to be the melting pot for all cultures, just as he said that the people of the State over the years had distinguished themselves in making others feel home away from home. Ambode recalled that since inception, Lagos had effectively transited from an administrative entity to becoming the melting pot of cultures and the socio-political and economic jurisdiction of global significance, rated today, as the fifth largest economy in Africa. He described the lecture as an opportunity to have introspection into the past, engage in an objective appraisal of the present and, a realistic prognosis of the future of another fifty years. The governor said such necessitated the assemblage of knowledgeable royal fathers, elder statesmen, jurists of distinction and Lagos indigenes of repute to trace the history of the State and proffer insights as to the areas to concentrate on for the future. Going down memory lane, Ambode said: “It is important for us at this epochal gathering to refresh our memory about the beginning; the journey of how the Aworis played an important role in the evolution of what we call Lagos today. “The same applies to the evolution of the Eko Royalty with the coming of the Bini from present day Edo State and even the momentous role played by the Tappa in the making of our dear State. Our greatness is in our ability to be the melting pot for all cultures and as at today, there is no tribe in Nigeria that is not represented in Lagos. From the Hausa/Fulani to the Igbo to the Kanuri to the Ibibio, the Nupe, the Berom, the Igala and so on and so forth all have spaces to live and live well in our dear State. “Lagos is not just national in outlook. It is international. The Americans are here; the British are here; South Africans are in their thousands; the Chinese are not in short supply; and the Indians even have a community in Lagos. “With all sense of modesty, there is no other State like Lagos in Nigeria. Some may say we owe this to the fact that Lagos used to be a Federal Capital Territory. But I really do not think so. While that may have contributed to our greatness, we are also a unique people ready to make fellow human-beings from other lands feel home away from home,” he said.